Volkswagen India has started dispatching the 2017 VW Passat to dealerships ahead of its reported launch on October 10. 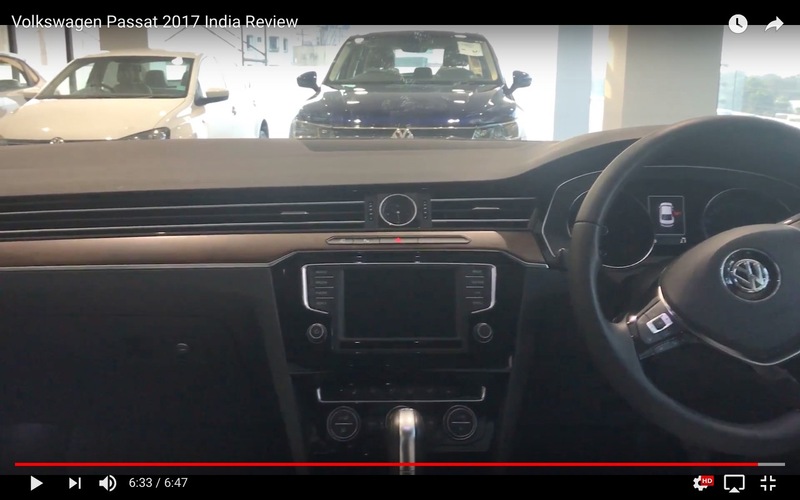 One example was videotaped by Youtuber Techbuzz, completely revealing the exterior and interior of the India-spec Passat. The Passat featured is based on the top-end Highline spec, finished in the Pure White exterior colour. It has chrome accents on the wide grille, front apron, side sill, window line and rear bumper for that premium look. Other features include 17 inch 'London' alloy rims, LED headlamps and taillamps, parking assist with front and rear sensors, and sunroof. Inside, the Passat has a Titanium Black colour theme contrasted with silver accents and wood trim across the dashboard and door cards. Seats are upholstered in leather, and the front seats have 12-way 'ergoComfort' power adjustments with ventilation and memory settings. Some of the equipment in the top-spec Highline grade, include power-operated boot-lid with hands-free 'Easy Open' to access the 586L boot volume, 'Composition Media' touchscreen system with Apple CarPlay and Android Auto, automatic headlamps and rain sensing wipers, three-zone automatic climate control, electronic parking brake with auto hold, power operated rear sunblind, and 360 degree camera system. It comes standard with ABS and 9 airbags. Inside, the Passat has a Titanium Black colour theme contrasted with silver accents and wood trim across the dashboard and door cards. Under the hood is a 2.0L 4-cylinder turbodiesel engine that is reported to produce 177 PS and 350 Nm of peak torque. It is paired with a 6-speed DSG automatic that shuffles power to the front wheels. Like the Tiguan, the VW Passat is also assembled at VAG's plant in Aurangabad. Prices are expected to start from INR 37 Lakhs (on road).